Nothing is more satisfying than whipping up amazing treats in a flash because certain ingredients were made ahead of time. This recipe makes use of my last post, the Homemade Pesto recipe. I'm glad to have seen some friends churn out this awesome sauce themselves and used it very creatively, I might add. I'm a proud Momma! Now, this is the part where I teach you how to make a spread that brings you right to Italy (even if I haven't been there YET! ), as the "Tricolore" title suggest. When I used to take food orders, this was one of the items on my menu. My husband and I sold it to friends, family and officemates. It sold especially well during Christmas season because the colors were so vibrant and festive. Some served it as part of their holiday table and some gave them away as gifts. Whatever way you decide to use this spread for, ENJOY! Whisk together or cream together the cream cheese, lemon juice and salt. 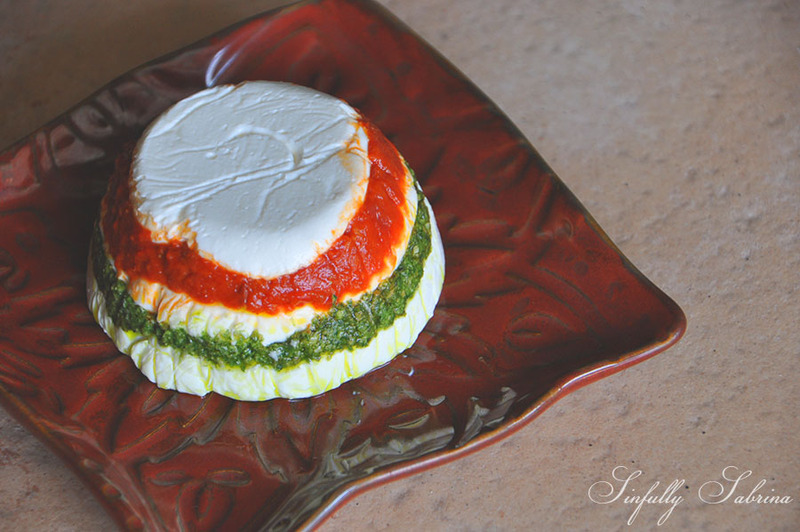 Line a 250 ml plastic container with plastic wrap, pipe cream mixture until the bottom is filled, spoon basil pesto and spread, pipe another cream cheese layer, spoon red pesto and spread and pipe the last layer of cream cheese. Unmold when ready to serve. Combine all ingredients in a blender and pulse until you have a thick marinara consistency. This recipe makes about 3-4 250ml plastic containers. You can use a bigger container if you are expecting more people to come.